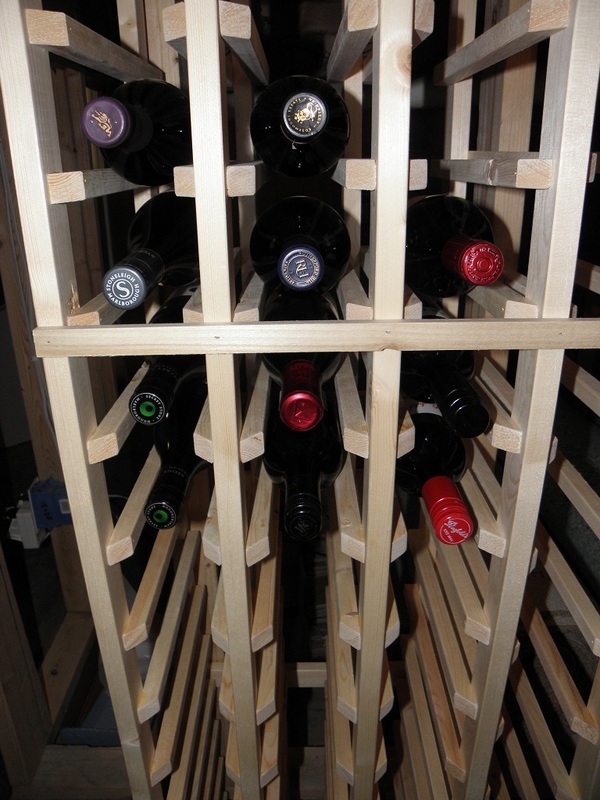 It took less than a day to build the wine rack and just over $50 in materials. I chose to build it out of pine to be as inexpensive as possible. I don’t plan on this ever being a showcase, just a rack to store wine in (eventually) a controlled climate. It’s modular in that I can build more of them and place them alongside this one, although I can’t imagine I’ll ever need more than two. I’ll probably never need more than this one as we tend to drink our wine rather than store it. But we only had limited space to store wine before, so now that we have more, we may store more. Anyway, the hardest part of this job is cutting (and hand sanding) the individual pieces that hold the wine bottles. Each bottle needs two pieces, so for 74 bottles, that’s almost 150 pieces. I started with 1×2 boards and ripped them in half to create 1×1’s. These were then cut to 12 inches long and then one end was cut at a 45 -degree angle. These pieces were attached to two 1×2 boards to create a “ladder”. The rack has five ladders to support the four columns. I used glue and a nail gun to attach the 12″ pieces. It made quick work of the assembly (two nails per board). I used two “spacers” while nailing up these pieces so they were a consistent height and the pieces were in-line from ladder to ladder. The ladders are supported by two cross braces at the bottom, two at the top, and three at the back (lower, middle, upper). Each cross brace was dadoed and the ladders are inserted into the grooves. All seven cross braces were dadoed at the same time, so the grooves are all equidistant, ensuring the ladders are parallel with respect to each other. One last cross brace was attached to the front, although this one was not glued. If I eventually have two racks, I will replace this with a piece of trim across both racks. For now it is just a 1×1 piece of the leftover pine. Here is another picture showing a view of the groves at the base. The base was then built up with a toe kick (again, with 1×2 boards) to keep the bottom from sitting on the floor. 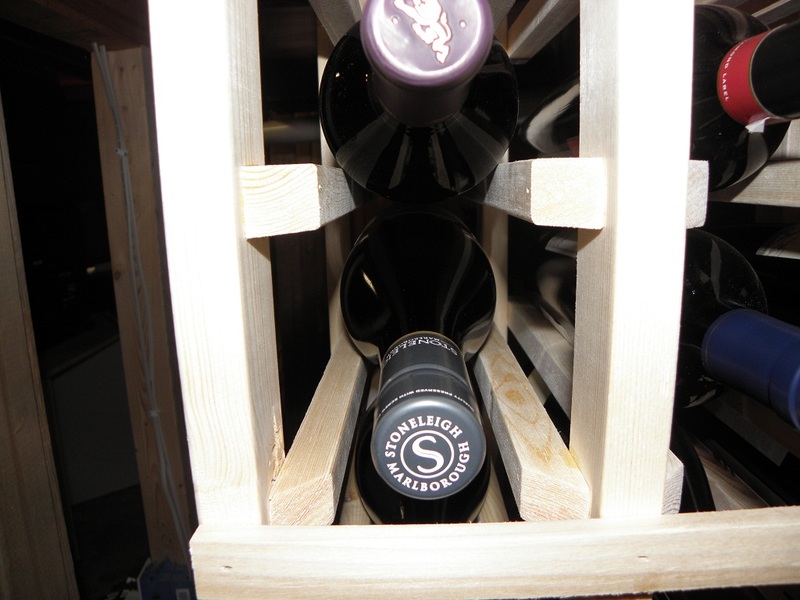 I look forward to filling this rack (but more importantly…drinking the wine we store).